Continuing the New Holland tradition of leadership in haytools technology, the dynamic new line of Speedrower self-propelled windrowers features a number of industry firsts that boost haymaking productivity and provide greater operator comfort and convenience. New Holland Marketing Manager, Simon Vigour, says the choice of three models and a broad range of attachments mean it is easy to create the right combination for any need. “New Holland is renowned for its detailed understanding of the hay and forage industry, and these new windrowers reflect that, with a range of on-board solutions and configurations to ensure operators get the most from their machines. “No matter the crop – lucerne, oaten hay, grass, wheat, canola, lentils or peas – HW Speedrowers deliver industry-leading cutting capacity. 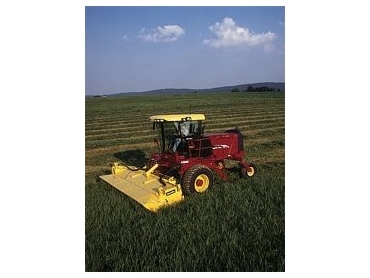 They offer increased power and a new level of control that leads to increased productivity. The models offer up to 225 horsepower – the highest on the market and a selection of sickle, disc and draper headers to match capacity and performance needs,” Simon explained. Among the features new to the market with the HW range is a 5.6 metre (18ft) DiscBine header. “That’s the widest disc out there,” Simon noted. With independent hydraulic header flotation, adjustments can be made to the left or right side from the cab, so hillsides and irrigation borders can be easily negotiated. As always, New Holland has matched improved functionality with improved operator comfort. The cab provides the operator with unrivalled visibility, comfort and convenience. “The HW SpeedRower offers an industry-first – Comfort Ride cab suspension as standard across the range. Utilising technology from our TS-A and TM tractor ranges, this design smoothes out bumps and vibrations from rough fields and results in far less of the bounce and jostling seen in other machines. The operator rides in greater comfort and is less tired at the end of the day. “In addition, the flotation springs and towers which were previously located on the platform have been removed, enabling us to greatly enlarge the cab entry and allowing the door to open more fully and provide the operator with wider access. The outside platform doubles as a tool storage area and an expansive toolbox is now built into the platform. This toolbox can be accessed from ground level and is lockable. The HW Speedrower is available in 120hp (HW325), 186hp (HW345) and 225hp (HW365) models.